National standards have been introduced for grain distillates from July 1, which means, for the first time in a century, Russia will be able to produce not what is popularly known as vodka, but national drinks that were popular in Tsarist Russia. Alcohol could, until recently, be distilled and produced in homes across Russia for personal use. Thousands of people have been doing just this, and are sharing their experiences on niche sites. In small towns in Russia, people frequently distil alcohol for personal use, but also for illegal trade. Bread wine is a distillate. It is produced in a way similar to grappa or Calvados, but the raw material used is rye, or rye malt. Rye contains some sugar, which plays a fundamental role in the fermentation process. In order to increase the volume of sugar the grain was malted. This sprouted rye infused with yeast yielded a potent home brew. It then went through double distillation through copper pot stills and bread wine came out. Identical technology is used to produce whisky, except barley is used instead of rye. The distilled alcohol was also purified to improve it. Among the many methods of purification, four are most popular; charcoal (most common), freezing (when all the unnecessary elements become frozen and the alcohol doesn't), milk and egg protein. Purified drinks are more expensive, and the wine infused with herbs and vegetables the most expensive. Bread wine infused with fruits and herbs was distilled again, and this class of drinks was called vodka. There are a huge range of these vodkas, with each region making something different. These included infusion (bread wine, infused on something without the addition of sugar), liqueurs (infusions with the addition of sugar), ratafii (liqueurs with the addition of fruit juice), liquor (concentrated fruit vodkas with very high sugar content) and so on. If the infusion was made with medicinal herbs, it was sold in pharmacies. Vodka as it is known today; ethyl alcohol, diluted with water, produced by industrial methods, and purified; formally made its appearance only in 1936. Modern vodka is usually consumed in one gulp and followed by chasers, while bread wine that has its own taste, is consumed in the same way as a cognac or a single malt whiskey, with savoured sips. To control the production of alcoholic beverages, the government of Peter I arrived at a way to recognize a quality product and to prevent attempts to dilute it, at a time when there were no alcoholmeters. Bread wine was boiled and burned, and if exactly half of it burned out, the drink was considered standard and called Polugar (from the Russian “half-burnt”). Then there were Nedogar (“under burnt”) and Peregar (“over burnt”), which were sent for second distillation. Today Russian businessmen produce a drink called ‘Polugar’ but since Russia could not produce it for commercial purposes, it is produced in Poland. The price is fairly high for Russia, almost 4-5 times more expensive than usual vodka. The variety of Russian alcoholic beverages is not limited to vodka and bread wine. One of the main alcoholic drinks in old Russia was honey. It was well known since ancient times among middle Europeans; ancient Germans, Scandinavians and Lithuanians. Historical sources say that honey was many times stronger than grape wine. It was boiled, infused and aged like wine. There were two kinds of honey - boiled and “stored” (“stavleny”). The latter was aged for 10-15 years or more, and it was a result of natural (cold) fermentation of honey with the juice of berries (cranberries, raspberries). Some time in the XIVth century, at princely feasts 35 year- aged honey was served. This drink began to be made to replace grape wine, the import of which was reduced due to geopolitical events of the thirteenth to fifteenth centuries. Cheaper, boiled honey was prepared for mass gatherings. Today's analogue of this kind of honey is ‘Medovukha’. It belongs to the category of light alcoholic beverages and its sale is allowed in the country. ‘Kvas’ is today a soft, non-alcoholic drink, bottled and sold in supermarkets. However, kvas that is made for personal use in villages has another quality and alcoholic level. 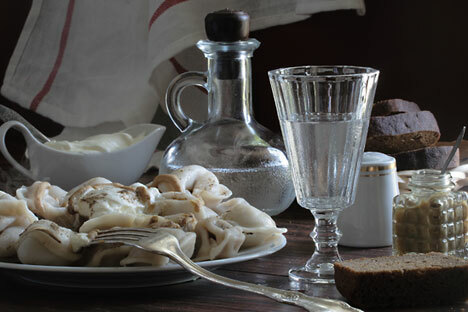 Kvas is made from bread, or rye, further overcooked, and the leaven covered with water and infused. The container is a wooden barrel of 20-25 litres. Once the drink is matured, more water and more bread are added and, in a few days, and kvas can be served again. Kvas made this way is as strong as low-alcohol beer. If we look through the old recipes, kvas is more like honey and beer, it is boiled. Sources from the eleventh and twelfth centuries' often mention beer, a word which originally meant any drink, but later was referred to as an alcoholic drink. However, it is not the beer as we know it today. What was called beer in old Russia was called ‘Ol’ or Olous; it was not only brewed from barley, but with added hops and herbs like sage and St. John's wort. Later ol became identified with beer. This article uses material from the book by William Pokhlebkin: "The History of Vodka".